Pattern Paradise always has the most beautiful photos! 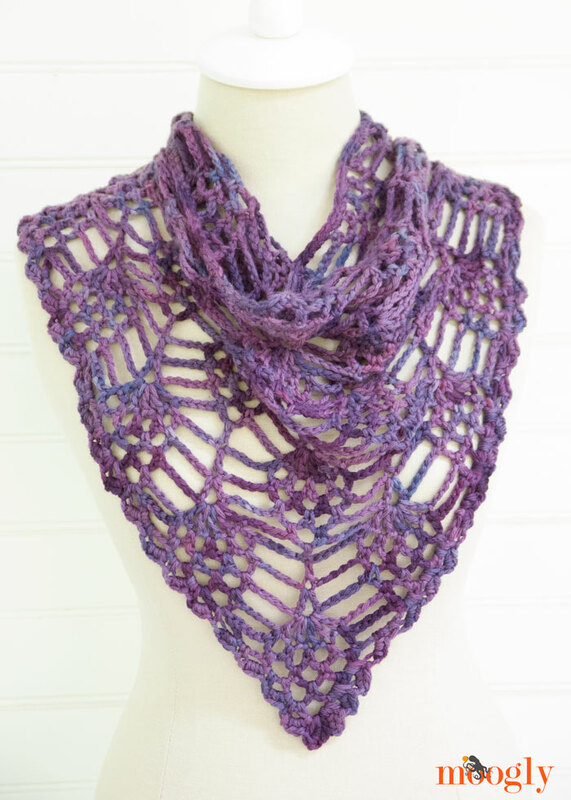 Besides being a great photo, this pattern for a crochet hair kerchief is absolutely lovely! I agree with the designer that these were popular in our youth, and I do also see a comeback being made with these. They are cute, easy to make, and work up fast! I love they they can hide a bad hair day! Granny squares are fun and can be used in so many different ways, like this pretty tank styled crochet tunic top! A great aspect of this pattern is that, even though worsted weight yarn was used, you can easily implement your own yarn weight and adjust the size. Of course a light weight yarn would require more work, however, would be more suitable for summer. I would love to give this one a try! This is a Ravelry download. Red Heart 3.5 oz multi color 4 ply "Grape Fizz"
Red Heart 7 oz solid 4 ply "Dark Orchid"
I've got pineapples and summer on my mind, and this pretty shawl style cowl fits! Using a light DK weight yarn, you will easily get a grasp on this version of the crochet pineapple stitch and turn it into something beautiful. This would make a great spring/summer scarf or cowl, or even wear it as a shawl! "Oooh...ahhhhh!" Look at this long crocheted pineapple skirt! I love crochet wearables, especially dresses and skirts, and this one is stunning. The designer assures that a dedicated beginner could make this skirt, I think the biggest challenge is time. But time well used, the end result is marvelous. The designer includes diagrams with a photo tutorial. You'll be envied when you wear this skirt! My favorite colors right here, in this awesome corner to corner crochet blanket! This particular design is for a baby blanket but would be easy to make larger. 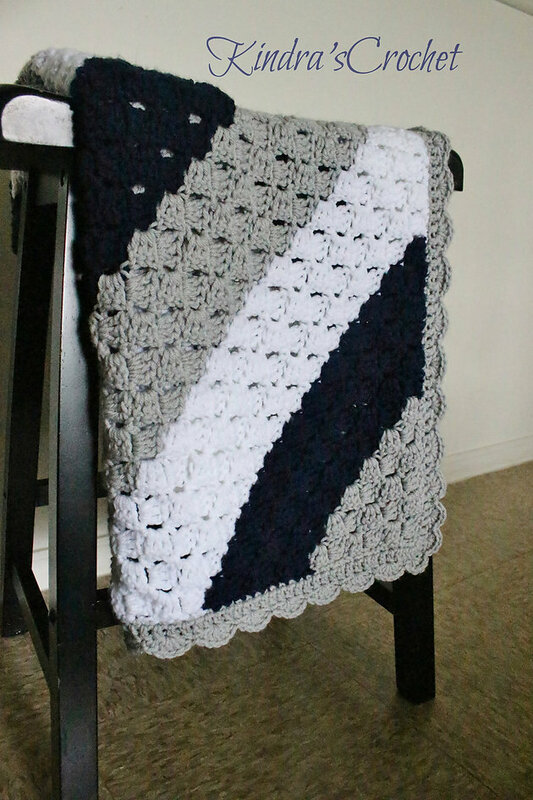 However, this is still pretty amazing as a baby blanket, I love the diagonal pattern, it's sharp and trendy and would look great in baby's room! What I love even more about crochet baby decor is that you can make it match your theme easily by using whatever colors you want. This would be a lovely baby gift. If you have extra sock yarn laying around and really don't want to make socks, then try this cute swirly crochet necklace! This fun pattern uses light sock yarn and a small hook to get the chains to curl properly. I really like this idea and can think of many ways to make it my own, by adding beads, and different colors. I haven't been over to check out Red Heart's free patterns in a while, until today... And they have some nice new patterns! I immediately fell in love with this beauty! This awesome crochet cover up uses combed cotton and a large hook, so it works up quickly, which is exciting, because I love a quickie project that I can wear! I am nowhere near a beach, but I would wear this over a simple slip dress. I love it! Spruce up your home decor this spring with some beautiful crochet mandala place mats! This is such a great idea because you can use any color combination to match or contrast your room. But don't stop there, you could even make these for your outdoor space, these would also look great on your patio table. Catania in 4 colors (Sport; 5 ply); 137 yds by 1.75 oz, or 125 m by 50 gr. Measurements: diameter will be about 14.5 inches, or 37 cm. Here's a great spring project for you! 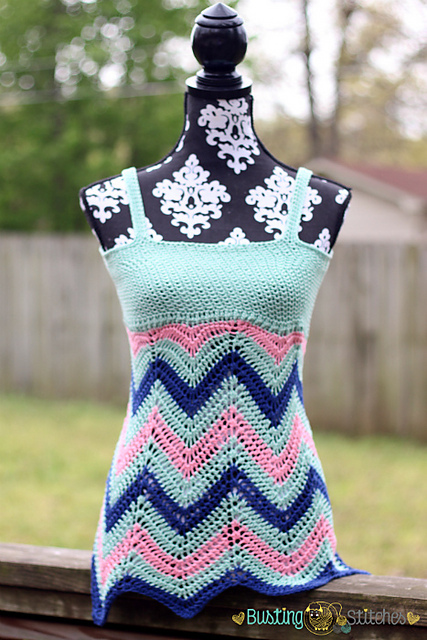 This lovely crochet chevron tank top is beautiful and flattering. I love the use of color and design here, and can think of several other color combinations that would look amazing. It's a great feeling to wear something unique that you made yourself, especially when the compliments start rolling in! This cute crochet sun hat comes right int time to have ready for the spring and summer weather. Using worsted weight cotton, it works up quick! You'll be wearing yours in no time. If you're an avid crocheter, you probably know all about DROPS Design from Garnstudio. Based out of Norway, with over 100 stores selling their yarns across the world, they have one of the most beautiful assortments of free patterns, crochet and knit alike! Their website is easy to use with 17 language translations and an easy to use pattern search. I love looking at all of DROPS Design's patterns, but today I am focusing on summer! When I think of summer, I think of beautiful white flowing and lacy styled garments with a relaxed causal vibe. Some of these patterns are new to 2016 and some you may have seen in the past, but they are all the perfect picture of summer. Enjoy! Janis - jumper worked in a square with flounce sleeves and lace pattern in ”Paris”. Size: S - XXXL. Pina Colada - skirt with lace pattern and overlap, worked top down in ”Safran”. Size S-XXXL. Light's Embrace - poncho with lace pattern, worked top down in ”Paris”. Size S-XXXL. Seashore Bliss Cardigan - jacket with lace pattern and round yoke in ”Cotton Light”. The piece is worked top down. Size: S - XXXL. Elvira- top with crochet squares in “Belle”. Size: S - XXL. Country Girl - hat with fan pattern in ”Muskat”. Barcelona - jacket with lace pattern and fringes in ”Safran”. Size S-XXXL. Elly May - shorts with double crochet and lace pattern in ”Safran”. Size: S - XXL. Summer Escape - skirt with double crochet, lace pattern, worked top down in ”Safran”. Size S-XXXL. Aphrodite - top with fans and star pattern in ”Cotton Light”. Size: S - XXXL. Summer Rose - head band with flowers in ”Safran”. Lily of the Valley - poncho with squares in ”Safran”. Size: S - XXXL. DROPS 128-26 - bikini with fan edge in ”Safran”. Size: XS - XL. DROPS 128-25 - top in ”Safran”. Size: XS - XL. DROPS 69-1 - top in Safran. I've been waiting for a new crochet jewelry pattern, so I was very happy to find this crochet bracelet pattern today! It's different, unique, and beautiful. I really like the way that this is designed, it seems simple, but has an interesting detailed look. The pattern calls for crochet thread and a bead, and I have lots of those laying around, I'm going to make this today! This awesome crochet top caught my attention right away! I love the circular detail, the color, the yarn, the fringes, everything! This top definitely has some bohemian appeal, and I think it would look great in any color I would love to have the time to give this project a go.